In order to ease the port-related traffic pressure from the city, the 1975 Karachi Master Plan proposed a Northern Bypass (NBP) and a Southern Bypass, both skirting the city to join the Super Highway and the National Highway respectively. While the government has completely forgotten the Southern Bypass, it is so excited over the port-Super Highway connection that it wants to build not one but two roads for the related heavy-vehicle traffic the Northern Bypass and an elevated Expressway going through the Lyari corridor. Facts differ. Officials from the Karachi City Government forcibly evicted thousands of people and destroyed over 2,000 homes in parts of the Rehmatya Colony in order to make way for the construction of the Lyari Expressway. The project, which began in 2002, has to date destroyed over 10,000 housing units and 3,100 commercial units. The renewed efforts began on January 2, 2006 where over 400 houses from the Muslim community and all 250 houses and two temples from the Hindu community were destroyed in ten days. According to government estimates, around 12,000 houses and 1000 work places will be demolished to make room for the Expressway. Although various community surveys and studies indicate these numbers to be three times as high, to accommodate even the government figures requires about 600-700 acres of land. The Karachi Development Authority (KDA) is noted for many things, but efficiency is not one of them. It would be foolish to expect it to develop this much land and related infrastructure in six months time. Additionally, it is expected that up to 100,000 children will be deprived of education as several schools will also be demolished. Since the demolitions by the Karachi City Government began, surveys report approximately 10,000 houses and 3,100 commercial buildings have been destroyed. No notice or compensation has been given to any of the victims when the demolitions occurred. As a result, the majority of the homeless victims now live on the street with no shelter, food, water or heat in the extreme cold conditions. The government has provided no amenities and the food that has been received was donated by local charities and NGO’s, but supplies are dwindling. It is important to highlight that the demolition procedures are in complete violation of previous commitments made by the city government. In a letter to the UN commission on housing rights written by the previous city district government, the local administration assured the UN agency that they would not proceed with the demolition of houses unless a 15 day notice and appropriate compensation was given to the victims. Additionally, in October 14, 2003 the High Court of Sindh directed the National Highway Authority (NHA), Government of Sindh and the City District Government of Karachi to review the design of the Lyari Expressway so as to minimize the number of people to be affected by this project. Instead however, only 400 houses have received some compensation and the local administration has completely ignored the court order. Compensation has also been hindered by land grabbing and the issuance of plots in fake names. In Addition, the evictions which occurred in early January were also extremely violent at times, and have resulted in the deaths and injuries of several people. Many of the harmed victims were from the Hindu community of Prem Nager. The eviction in this Hindu neighborhood was particularly disturbing because all 250 houses in the area were demolished. Violence and threats against activists and other protestors have also occurred on several occasions. It is appalling that in the name of development, the city government has destroyed the homes and livelihoods of thousands of people, without providing any notice, compensation or alternative land to the victims. The project is estimated to affect more than 50 communities and over 300,000 are in jeopardy of becoming homeless, although the city government is not deterred by the number of lives being destroyed. It is even more disturbing to know that city officials have acted violently and callously towards all the victims, and even more poorly towards the Hindu minorities who live in the affected areas. The issue here is not the Expressway, but the rights of the people. Not simply their unalienable right to shelter, but also their right to choose where they make their homes and their right to defend their communities and resist forced resettlement. These forced evictions affect all. The Lyari Expressway is meant to run over the embankments of the Lyari River, encroaching up to 100 feet on each side of the Lyari naddi. For this, the area given to the Baloch of Karachi by the Khan of Kalat in 1780 must be vacated. This is not just land they are wiping off the map, but also a part of the city’s heritage and history. Like preserving Mohatta Palace and the Quaid’s mausoleum, it is necessary to preserve these age-old communities that make up a legacy people owe to posterity. We can’t just leave KFC and McDonalds for the future generations of Pakistanis. 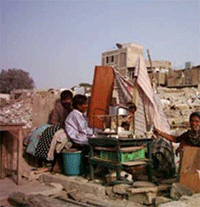 The city of Karachi is home to more than 4.5 million people living in slums or katchi abadis. Not all the slums are in the area that is to be transformed into the Expressway. In fact, there are approximately 1,200 katchi abadis. More than 16,740 houses have already been razed to the ground in what the city government likes to euphemistically call the ‘clean up’ project. The terms ‘anti- encroachment drive’ and ‘beautification scheme’ have also been used in an effort to sanitise what ultimately amounts to acts of violence by the men and women elected to serve and protect the citizens of Karachi. Many evacuees do not even have the offer of compensation or resettlement. While the government can play hide and seek with its poor, shifting them out of eyesight and constructing meagre shacks for them to live in once their homes have been claimed, the one thing it cannot do is compensate the dispossessed for their memories, their schools, their graveyards, and their anger. Deliberately creating a refugee population flies in the face of the development and progress the government claims to be pursuing. Recently, between February and May 2006, the city government has started a major campaign for road extensions and widening in the city. More than 3,000 houses were demolished, involving more than 23,000 displaced people. No prior notice or compensation or alternative lands were given to the inhabitants. The latest demolition was on 5 May where the City government demolished 250 houses in Sikander Goth (village) for construction of a high-rise building. A community activist was shot dead and another was seriously injured when police open fired during a peaceful demonstration. According to the agreement between the former City Mayor of Nazim and the UN monitoring team in September 2003, the City District Government in Karachi would issue a notice 15 days before the demolition operation and provide Rs. 50,000 compensation and 80 square yard plot of land each to the displaced families. However, the present City District Government disregarded the agreement and carried out the demolition operation, uprooting almost 30-year-old settlements. According to the source, the Karachi City Government is planning to demolish and evict inhabitants of another 6,000 housing units in 20 different informal settlements throughout the city, including in Gulberg, North Nazimabad, Saddar, Jamshed, Gulshan-e-Iqbal and Liaquatabad. When completed, the Lyari Expressway project allegedly will have rendered an estimated 250,000 people homeless. Most of City planners feel that the Lyari Expressway is not a priority for the city. The money that is being spent on it can be better utilized for improving the existing Karachi road network and completing the missing road links. Once immediate essentials have been developed, only then should we move onto projects that involve large-scale dislocations. NGOs held several meetings with communities (which could be displaced) around the Lyari corridor and provided them with information on the current development of the project, so that these communities could prepare themselves for lobbying with the government. 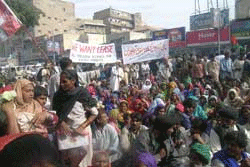 The communities across the Lyari Riverbed continued their protest demonstrations and rallies. Apart from this, the communities and the Action Committee for Civic Problems (ACCP) held a number of meetings with government officials, politicians, (including MPAs, MNAs, and Senators) and journalists. The communities and the Action Committee for Civic Problems (ACCP) held more public gatherings and meetings during this reporting period. The High Court of Sindh (SHC) on 14th October 2003 directed the National Highway Authority (NHA), government of Sindh, and the City District Government of Karachi (CDGK) to review the design of the 16.5 kilometer long Lyari Expressway so as to minimize the number of people to be affected by this project. The court also directed the government to pay market values of all leaseholders. Surveys showed that the government is ignoring the High Court’s decisions. The resettlement process lacks transparency and community participation, besides creating numerous hardships for affected communities. The government is completely unable to lay down the promised infrastructure in the resettlement site. 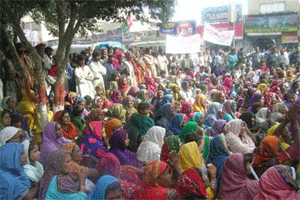 On 23 September 2005 the residents Zia-ul-Haq Colony Gulshan-e-Iqbal staged a protest rally against city government. The residents got enraged as city government announced the demolition of their houses for Lyari expressway. The police resorted to firing on the peaceful demonstration causing injuries to one of the community activists. The injured person, identified as Salahuddin. This police firing incident ignited the community and several hundred people gathered against the police. The enraged community protesters then marched towards the main Rashid Minhas Road near Moti Mehal, where they blocked the vehicular traffic. The area police resorted to teargas shelling and firing in the air. The police also arrested nine persons on the charges of creating law and order. Citizens of Karachi must take a stand now, before it’s too late for our society and its people. We must, as Gandhi said, be the change we wish to see in the world. Our city government’s casual approach to human life will not and cannot stand any longer than it already has, we simply mustn’t allow it. to consult the affected families and civil society in general when undertaking development projects, including the on-going Lyari Expressway project. Controversy has surrounded the Lyari Expressway Project since it first began in 2002. The expressway, which will be 16 kilometers long and is expected to bring in Rs. 400 million of revenue, was originally proposed to alleviate several problems including the erosion of the Lyari riverbeds and traffic congestion in the area. However, opponents maintain that the development of the road will not only displace thousands of people and affect 50 communities but also only add to the traffic and congestion problems in the city. Additionally, it is expected that up to 100,000 children will be deprived of education as several schools will also be demolished. Since the demolitions by the Karachi City Government began, surveys report approximately 10,000 houses and 3,100 commercial buildings have been destroyed. The Sindh High Court too has taken cognizance of the blatant violations of constitutional fundamental rights as a consequence of this project and at the moment is hearing a constitutional petition filed by prominent political parties and non-governmental organizations of Pakistan. 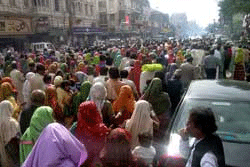 The city’s actions have also been met with regular protests by the victims as well as social activists. As a result, violence and intimidation by city officials and police officers has often ensued.